Ben Allen and Jacqui Slack won XTERRA England and Hector Guerra finished fourth to join Helena Erbenova as this year’s XTERRA European Tour champions at Vachery Estate in Cranleigh on Sunday. Vachery Estate/Cranleigh – Surrey, England (September 8, 2013) – Ben Allen and Jacqui Slack won XTERRA England and Hector Guerra finished fourth to join Helena Erbenova as this year’s XTERRA European Tour champions at Vachery Estate in Cranleigh on Sunday. It’s the seventh XTERRA major victory of the season for Allen, the fourth for Slack, and the third time the “power couple” and reigning XTERRA Warrior award winners have took home titles on the same day. For Guerra, a bad ankle sprain was not enough to keep him from finishing in the top five and winning the Tour in his first-full season with XTERRA. Helena Erbenova previously wrapped up the women’s title following a dominating mid-season five race win streak. Meanwhile Yeray Luxem continued to impress, placing third in the race (just six seconds behind course designer and hometown favorite Sam Gardner) and second in the Tour. For the women Muller finished second in the race and jumped past Renata Bucher to place second in the final Tour standings as well. Dreams really can come true. 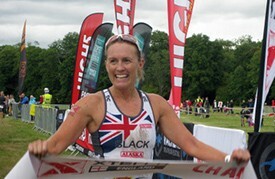 At XTERRA England it happened for Jacqui Slack and Hector Guerra and Sam Gardner. Jacqui was racing in England for the first time this year and her entire extended family was here to see her. Her Dad had never seen her in a major competition and while she smiled and seemed very happy, there was little doubt the pressure was on. For Hector Guerra, an unknown Spanish rider at the beginning of the season, it was a chance to become the XTERRA European tour pro champion. For Sam it was the culmination of years of work to bring XTERRA back to England just miles from where he was raised. All those dreams came true. Jacqui handily won the women’s race beating German pro Kathrin Muller by nearly four minutes. For Hector it was not quite as easy. Guerra needed to finish 5th or better to keep his championship points lead over Yeray Luxem and Nico Lebrun. His swim was steady but slow and his bike, as always, was blistering. He caught and stayed level with Belgium’s Luxem and well in front of Lebrun on the bike. On the very bumpy run Hector twisted his left ankle and went down. He slowly dropped back, twisting the ankle another 4 or 5 times and found himself in 4th and losing time. While all this drama was unfolding, a now healthy Ben Allen was simply steaming away. Richard Stannard, arguably one of the fastest triathlon swimmers anywhere, took off at the start but Allen, a former surf lifesaver swimmer, stayed on his heels and the two exited the water with a very healthy lead. “I knew Richard was very fast and was able to use him to get the lead. Once on the bike I just hammered as hard as I could knowing Sam, Hector, Nico and Yeray were coming,” said Allen. Stannard rode about ½ a lap before his recently operated wrist began throbbing and he retired not wanting to damage it before Maui. Sam Gardner is a many time XTERRA winner and played a huge role in getting us back to his home country. Born just a few miles away, Sam worked with organizer Mark Davis to build a course at the fabulous Vachery Estate in Surrey, and knew this course better than anyone. Sammy was coming hard but Guerra was with him all the way. They caught Luxem and the three had a terrific back and forth battle taking time out of Allen’s lead. Kathrin Muller had raced ITU on Saturday and only arrived at Vachery the morning of the race – so late that she came directly to the race site, not even bothering to stop at her hotel. Slack and Muller were virtually tied coming out of the water, but Jacqui’s knowledge of the bike course was a huge advantage and she immediately pulled away. As she rode the course British fans cheered her on telling her to go as she was in 2nd place. What the fans did not know was the rider in front of her was on a relay team. At the end of the first lap she yelled to me asking how far behind she was. I ran to where she would start her second lap to let her know she was safely in front and not to worry about the relay woman rider. Yeray Luxem was on a mission. He knew to be the 2013 Champion he had to win. He left nothing out there and at one time got within 45 seconds of Ben Allen and well in front of Sam Gardner and the slowing Guerra. On the last lap of the run, Yeray simply ran out of gas and slowed. Gardner took advantage and in the last K of the race passed the young Belgium to finish second by six seconds. It was a wonderful finish for Sam as he came out of retirement for the 10th time. Fabulous features of the Vachery race are two big ditches one must cross twice on the run; going out and coming back. They are only about 100’ apart so spectators can get a good look at the carnage. The ditch is about 8’ across and 4’ deep. On race day it had a foot of water in it. When I saw it the first time I figured 90% would just jump down into it and climb out and 10% would jump it. I was wrong. About 90% jumped it. But not all of them made it! Kathrin Muller arrived the first time and yelled “what the hell is this?” She changed her name to Cat and did a crawl over a thin but sturdy branch that had fallen across the ditch. Another surprise for runners was immediately after the ditch was a Beautiful British Bog. A big tree in the middle of what looked like a dirt and leaf covered piece of ground. But if you tried to take the straight line from the ditch under the tree and back into the woods you were rewarded by sinking to your knees in the bog. The marshal tried as hard as she could to tell people to stay left but some saw the line and paid dearly for it. I saw at least half a dozen go straight and lose their shoes. Frustrated, standing up to their knees in the bog reaching down into it to retrieve a hopelessly muddy shoe. This small area of the race is definitely the signature. On the return side the ditch was a bit wider but had a bigger tree across it that most put a stride or two on and jumped off on the far side. So the dreams did come true – Hector finished 4th and became European Champion; Jacqui won her home country race in front of her family and hundreds of admirers; Sam Gardner, who worked so hard to get XTERRA back to England, made it happen and finished a brilliant 2nd. In typical English fashion the weather changed constantly through the day. One-minute sunny and in the low 70’s, and the next raining and in the low 60’s. Then back again to some sun but then breaking your heart with more rain. The Brits are a hardy and happy people. The rain came down again just before awards but most stayed inside the food tent chatting and having a bite to eat with hot tea or chocolate. We finally got awards going about an hour late and nearly all were still in attendance. The end of the season and the return of XTERRA to the UK happened at a great new course in the south of England just about an hour from Heathrow airport and 30 minutes from Gatwick. In the heart of Surrey and West Sussex this area is a postcard of England. Great pubs and B&B’s everywhere, country estates, small villages and even golf courses. Be prepared for typical British weather. Not cold but not warm, a bit of rain here and there and the friendliest folks you will find anywhere. Mark Davis and Richard Campbell put together a great first time event and should be proud. We heard nothing but praise for the course and the location and my guess is that next year entries will double. An absolute classic British experience and one to be planned for. Hector Guerra from Spain didn’t win a race outright this season but was the most consistent performer throughout with three 2nd-place finishes, a 3rd-place, and two 4th-place performances to earn the XTERRA European Tour Championship for the first time. Luxem was not far behind in second having amassed five 3rd-place finishes and a 6th, his best season in Europe thus far. Defending and four-time Euro Tour Champ Nico Lebrun finished third. For the women it was all Erbenova, who won the Tour title for the second straight season fueled by five straight wins. Muller finished in the top three six times to edge 4-time Euro Tour Champ Renata Bucher for second in the series, and Jacqui Slack won the last two races of the season to finish in fourth. Amateurs counted their best five of eight scores.